January sees the launch of a brand new monthly newsletter as part of the Training on Board project. Training On Board is an international training, nutrition and health project initiated by the Norwegian Maritime Authority in Haugesund on behalf of ISWAN. Training on board offers seafarers an accessible, free, and motivational programme that will encourage them to take care of their own health and fitness. 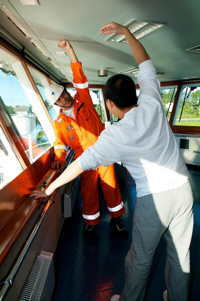 The site features workouts developed specifically for seafarers, concentrating on plans that are easy to follow with little or no access to equipment. The newsletter will feature exclusive added workout tips and health information. Seafarers signing up will also benefit from new articles added to the Training on Board site discussing topics such as vitamins, salt, how to keep track of calories and much more.